Conflict Management Techniques – Conflicts are integral parts our daily lifes. They may arise when two or more people do not agree on an issue. It is not possible to avoid them all the time. However it is possible to manage them by implementing a number of techniques. Likewise their effects in human life, conflict situations are significant problems in the workplace. They are the most common events that effect any organization’s productivity. In a project, when the stakeholder’ s goals, needs, interests and values interfere with one other, conflicts may arise. Many people think that conflicts have always negative effects on the organization but that is not true. Conflicts may have also positive effects depending on the situations. As a result of healthy competitions, conflicts may cultivate innovation and inventiveness among the employees within an organization. 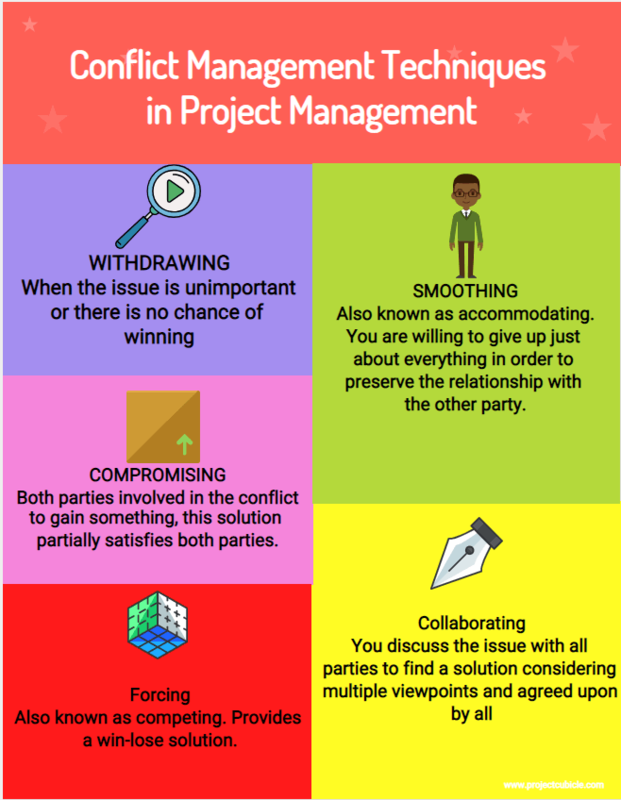 In this article, we will discuss conflict management techniques and their importance for successful project management. Issues that may cause conflicts must be controlled to prevent the advancement of a fight between project team and stakeholders. At this stage conflict management plays a key role for a successful completion. Poor conflict management decreases productivity, quality and team morale within a project. One of the most important job of a project manager is to resolve disputes in the early stage when the disputes are minor. Conflict management is the process identifing and handling conflicts efficiently. There are several techniques to solve conflicts. The PMBOK Guide recommends below five techniques. Withdrawing technique can be used by the project manager when the issue is unimportant or there is no chance of winning. In other words, the manager avoids and lets the conflict resolves itself. It is also known as avoiding. The withdrawing conflict management technique has some advantages and disadvantages. Some professionals do not accept withdrawing as a conflict management technique because no action is taken while implementing withdrawing technique. In the Smooting technique, the project manager accommodates the concerns of other people rather than his own concerns. Therefore this technique is also known as accommodating. Advantage of the smoothing conflict management technique is to save time by avoiding discussions that seem to take a long time. However it may have some disadvantages. Other parties may exploit the situation and create additonal advantages against to you. This may damage your position as a leader. In this technique, the project manager takes suggestions from both parties and makes a compromise. It is a common technique used for resolving disagreements. This solution partially satisfies both sides. The project manager can choose this technique when there is a need of a temporary solution or when both parties have equally significant goals. Compromising conflict management technique is a quick dispute resolution technique which creates a win-win solution. It ensures that all sides become a part of the solution. However in this technique none of the parties are truly satisfied. The project manager acts in a very assertive manner to achieve his goals or agrees with one party’s viewpoint and enforce the others. It is also known as competing. Forcing conflict management technique creates a win-lose solution which may demoralize team members and decrease their motivation. Although forcing provides a quick dispute resolution, it may negatively affect team’s morale. Therefore it is not recommended by the experts when teamwork is essential for success. In the collaborating issue management technique, the project manager negotiates the issue with all parties to find a solution considering multiple aspects. It is also known as win-win technique and the solution satisfies the concerns of both parties. The collaborating technique satisfies both parties. Therefore it can be categorized as a win-win technique. However it is a time consuming technique which is not suitable when there is an emergency. Organizations must overcome the challenges as a team in order to achieve the goals. It is significant to understand and apply the conflict management techniques in order to encourage team spirit. The best conflict resolution technique is the one that suits the situation best. In this article we discuss conflict management techniques. Note that this is an important topic for PMP Certification Exam. Only wanna remark on few general things, The website design and style is perfect, the articles is real great : D.